The shared Jim2.exe is actually a bootstrap program. When run, it establishes whether the user has a matching version of Jim2 installed locally (on the user’s computer or terminal server session). If not found, a new version is copied down to a location on the user’s PC. 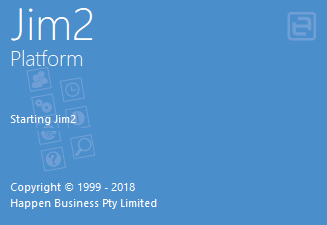 When running Jim2 for the first time, or after an upgrade on the Jim2 Server, you will notice an indicator on the splash screen stating Preparing Jim2. When Jim2 is running across a network, users can log on at any workstation using their own unique Jim2 username and password. As users move between the company workstations, the follow-me desktop feature ensures that logging on at any workstation will bring up the last active desktop for that user, including any open forms, live lists, etc. as well as the layout of the Nav Tree. 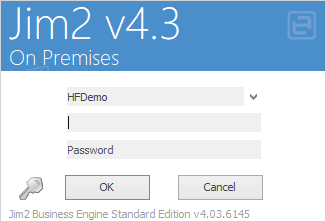 If Jim2 is not already running on the workstation that you want to use, you will need to start the Jim2 application. 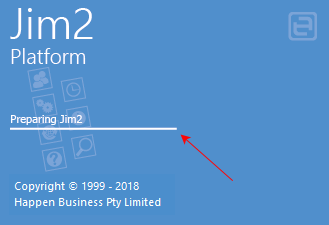 If it is already running, you must first log off the current user by selecting the icon in the Quick Access Toolbar, selecting Jim2 in the ribbon and selecting Log Off or by using Ctrl+ F12 to display the logon screen, shown below. When setting up a new user, you can specify that the user is required to change their password on first logon. Upon doing so, they will receive a message confirming the change. Passwords are encrypted and case sensitive. Last logon/date/time is also tracked. The Database field will default to the database specified in your Jim2 Configuration Settings. The Server field will only be displayed if the Show Server selection in your Configuration File is set to Yes. In order to log on to Jim2 you must enter a user ID and password. Initially, the user ID sys and password sys are the default. To create a new user identity, a card file with the user's details and password must be added to your system under the User tab. See How To Add A New User for more information. 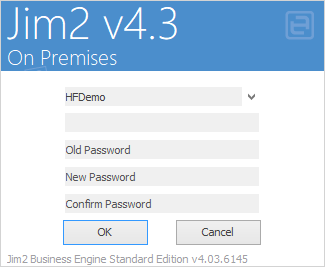 Once additional users have been added, they can log on by entering either their initials and password (as set up on their card file) or their Web Logon ID (only if Allow Web Access has been enabled in their card file). It is advisable to change the sys password as the default password is widely known. The card file for sys (the system administrator) will default to the security group of Administrator, which you will not be able to change. This is to ensure that, if security is accidentally placed on Security itself, you can log on as sys (system administrator) in order to rectify the problem. Logging on identifies the user via their card file information for Jim2's automatic time/date/initial stamping and security groups. For quality control purposes, edits performed anywhere in Jim2 will be automatically flagged with the logged on user's ID, as well as date and time stamp.